Puerto Rico in Mourning: Nearly Half of the Orlando Massacre Victims were from the Island | Democracy Now! mayor of San Juan, Puerto Rico. president of the National Lawyers Guild and associate counsel at LatinoJustice PRLDEF. Puerto Rico Gov. Alejandro García Padilla has declared Friday an official day of mourning after learning that 23 of the 49 victims in the Orlando massacre were Puerto Rican. On Tuesday, more than 300 people gathered in the capital of San Juan to honor those killed. Hundreds more gathered in Ponce. We speak to San Juan Mayor Carmen Yulín Cruz and Natasha Lycia Ora Bannan, president of the National Lawyers Guild and associate counsel at LatinoJustice PRLDEF. AMY GOODMAN: We need to ask—before we get to the end of this, we have to go to the shooting massacre in Orlando, the horror that took place there, 23 of the 49 victims Puerto Rican. On Tuesday, more than 300 people gathered in the capital of San Juan to honor those killed. Hundreds more gathered in Ponce. Puerto Rico’s governor has declared Friday an official day of mourning. Natasha Lycia Ora Bannan and Mayor Yulín, our deepest condolences, and Juan, for all of the victims. First, Mayor Yulín, your response? We only have 30 seconds. MAYOR CARMEN YULÍN CRUZ: —hear you. AMY GOODMAN: Mayor Yulín, your response to the Pulse nightclub attack? Well, let’s ask Natasha. NATASHA LYCIA ORA BANNAN: It’s an absolute tragedy. 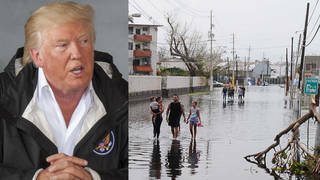 And I think that—I mean, the Puerto Rican community has been largely affected by this because, as you mentioned, half of the victims were Puerto Rican. Many of them had migrated from the island precisely because of the economic and humanitarian crisis that the mayor spoke about, in search of jobs, seeking more safety, seeking more stability, and encountered this horrific act of violence and homophobia and hatred. The community continues to mourn, not only in Puerto Rico, but in the diaspora. AMY GOODMAN: And, Mayor Yulín, your response to the killings in Orlando? MAYOR CARMEN YULÍN CRUZ: It is—we stand with the people of Orlando. We stand with those families of those 24 Puerto Ricans that were killed because of the horror of those that believe that love is only love when it’s done how they want it to be. I have this watch with the colors of the LGBT community, and those are colors that we should all have ingrained in our mind and in our conscience. And to all those people out there, being Puerto Rican or not, hate is not the way. And we need to move forward. We need to accept people for who they are. And everyone has a right to love whom they want to love, because love is love. AMY GOODMAN: We must leave it there. Thank you so much, San Juan Mayor Carmen Yulín Cruz and Natasha Lycia Ora Bannan, associate counsel at LatinoJustice PRLDEF.